Boating is so much fun for the whole family! What better way to cool off on a holiday such as Memorial Day than to spend it on the water. The kids love the tubing and the wake boarding. The parents love floating on the lake. Safety Checklists should be completed prior to each trip and could include things such as checking the weather, having a general float plan, verifying fuel and oil, checking for life preservers, stocking tools, emergency supplies, and verifying that boat maintenance is up to date. Make wearing a life jacket a priority for everyone. At a minimum, be sure to identify all non-swimmers and make sure they are wearing life preservers. 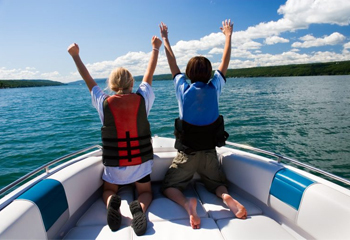 The majority of fatalities from boating accidents occur due to drowning. Per the U.S. Coast Guard, over 80% of drowning victims were found not wearing life saving preservers. Attach a whistle to each life jacket for additional safety. Avoid Alcohol. Sober driving means safe driving. Designate a sober driver for the day to prevent any unwelcome incidents. Boating Under the Influence (BUI) is a serious matter. According to Austin Boating Accident Attorney, Joe Lopez, “Many boating accidents are caused by uninformed drivers, negligent drivers, or inebriated drivers.” If a drunken boater injures another person, they could face serious legal and monetary consequences. Read the laws. Take a boating education course for your state. Some states not only require a boating license, but also require boating education hours for vehicle operators. A boat is a big, heavy, fast moving machine. Not knowing the necessary boating laws could lead to poor split second judgements that could mean life or death. Trust your instincts. If something feels off, sounds strange, or looks unusual…don’t ignore it! Don’t let others pressure you to take the boat into areas you are unsure of. As the boat operator, you have the most at stake. Make sure you are comfortable wherever you cruise. Now, go have some fun on the water and be SMART!